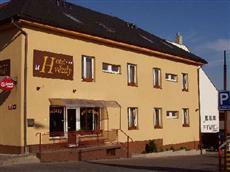 Hotel U Hvezdy offers it's guests a pleasant stay in the quiet surrounding near the Prague Castle area. It is well connected by tram /cable car/ to the main city attractions, including Prague Castle, Charles bridge, Mala Strana, Wenceslas or Old Town Square. The hotel has a renowned restaurant with traditional Czech and international cuisine. Folklore evenings are held in restaurant hall, where music is played and food served with beer, wine and non-alcoholic drinks. Close to the Hotel U Hvezdy (Star) there is the Brevnov Monastery and Renaissance villa Hvezda(Star) built in 1555. This building has a ground plan in the shape of a hexagonal star-this is the reason why the name Hvezda(Star) has been given to the villa, to its park and to our hotel, as well. The 3-star hotel U Hvezdy offers nicely-furnished rooms in quiet surroundings near the Prague Castle area and only a few minutes from the airport. The Hotel provides amenities like Safe deposit box , Secretarial services , Bar , Internet access-High-Speed , Laundry service , Lobby , Non-smoking rooms , Tour desk , Concierge , Parking facilities-free of charge , Currency exchange , Reception , Doctor on call and Restaurant .